D-Bat is a premier wood bat company that uses only the finest northern white ash or hard rock maple (sugar maple) to make their bats. They use the most modern equipment available, which allows them to produce a consistent product. Their bat finish is the most durable in the industry because they use a proprietary sealer and top coat. 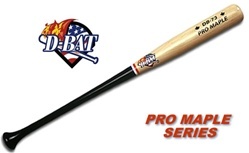 D-Bat offers baseball bats for players from Little League to high school to college to professional and adult leagues. 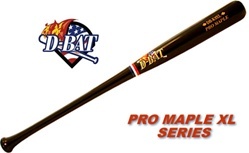 Starting with Youth and Senior League bats for younger players and continuing on through their Pro Stock and Pro Maple series, D-Bat has exactly the style, length, weight, color, and model which is perfect for you. When you use a D-Bat product, you are using the very best. All D-Bats come cupped, have a weight drop of about -3, and are available in multiple color combinations. Add a personalized inscription to your bat for $7.50 extra. Bats typically ship in 3-6 days. D-BAT also makes gloves, tees and more - check out their other products throughout this site! This popular youth bat is a big hit with the younger players ages 7-12. It complies with Little League regulations and has a length/weight ratio between -8 to -12 with a traditional Knob. Choose from multiple colors. Pick your bat model, then pick your colors! Choose from 14 different models in D-Bats's Pro Stock ash bat series. Bats are cupped and the Length/weight ratio is their standard -3. D-BAT is the only wood bat manufacturer that offers a big barrel youth bat with a length/weight ratio of -7 to -8. This bat is for the select players from ages 7-12. Choose from multiple colors. MAKE THE TRANSITION TO WOOD WITH POWER TO SPARE! 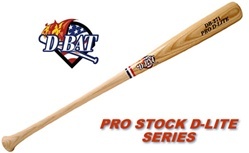 D-Bats's Pro Stock D-Lite ash bat series are popular with the younger players who are making the transition from aluminum to wood and also adult league players. The length/weight ratio is -4 to -5 which is lighter than their standard -3 models. Available in Models 271 and 161. This fungo has the traditional profile with a conventional taper from handle to barrel. Available in ash only. Choose from multiple colors. These are the same bats DBAT makes for the Pros. High quality ash wood with 15 grains or less. Pick your bat model, then pick your colors! Choose from 14 different models in D-Bats's Pro Cut ash bat series. Bats are cupped and the Length/weight ratio is their standard -3.